A song written for Healing Heroes Network! On a normal day at HHN headquarters, the radio may be playing in the background, but that's usually the extent of our involvement in the music industry. That recently changed when a songwriter/musician by the name of Joseph "Joe B." Benintende aka "BENin10D" a New Orleans native, now living in Birmingham, AL and a Live Nation retiree joined together with us. Little did we know, but Joe B. has a huge heart for our nation's Heroes. He was even featured on CNN a few days after 9/11/01, featured during the Presidents National Day of Prayer, singing a song he wrote entitled "America, This Country That We Live In", which believe it or not still 9 years later can still be heard on radio and TV. Everything "BENin10D" does America wise is never for profit, any download of "Healing Heroes" will be given straight to Healing Heroes Network ! ! After hearing about HHN, Joe B. put pen to paper once again, and wrote a song especially for us called "Healing Heroes". We at HHN are so thankful for his support, and hope you will give his song "Healing Heroes" a listen. 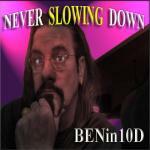 You can find it and other original songs on his web site which is www.BENin10D.com and on our site as soon as the new version of our site is complete. Pardon us if the link may not work, if such is the case, please copy and paste. The support of people like Joe B. will always be music to our ears! Don't forget to find us online!